For hubby’s birthday, we went back to Jerry Lawrence Park (already a favorite) for a picnic, fishing, and coconut cake. We didn’t catch any fish. This is a beautiful spot but it’s not deep off the dock and is shallow quite far out (or at least far enough out than we could cast). The fish were jumping about five feet from where our bobbers were floating. Oh well … the boys both enjoyed the fishing in spite of the disappointing result. 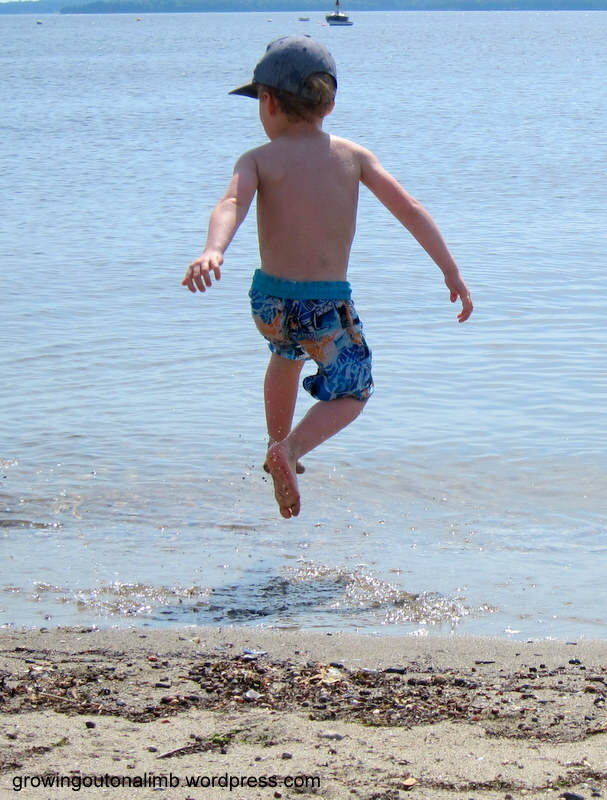 Shallow water – not good for fishing but a bonus when your five year old falls in. The picnic was yummy. Brian’s brother and niece came by for a while for a piece of cake too (which did not have for-<ahem>-some candles, by the way). Eleanor had a good long nap in the car, then took in the picnic as well. We are lucky to have this park so close by and will be trying the fishing there again. And Hubby says he got everything he wanted for his birthday so it was definitely a successful outing! Categories: Eleanor, Emerson, Holidays, Me and My Daddy, Oliver, Spring, The Great Outdoors | Permalink. 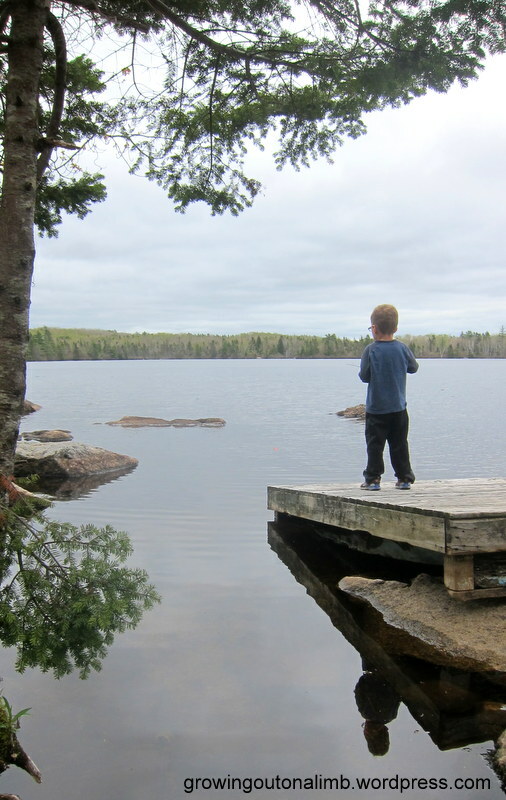 The provincial park nearby is small but lakeside so there is lots to do … hiking, fishing, boating. It is still closed so hubby and the kids had to walk in on this day but I am told they had a great time (as I unpacked more of the kitchen!). 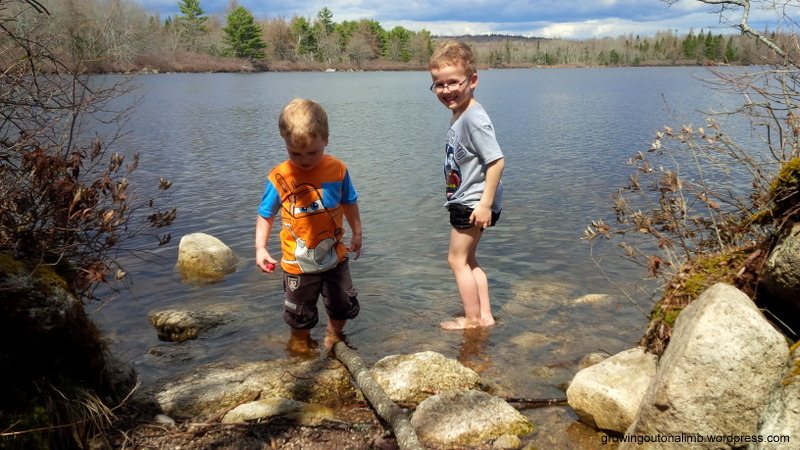 The boys told me they took their shoes off and dipped their toes in the water. “It was sooooo cold!”, Oliver said. They didn’t hike any of the trails so I’m looking forward to checking those and the entire park out for myself! Categories: Eleanor, Emerson, Family Fun, Me and My Daddy, Oliver, Spring | Permalink. We are not wasting any time exploring the area that we live in now. We are fifteen minutes from the city (ten more to downtown), ten minutes from a provincial park, and ten minutes from St. Margaret’s Bay. That means there is lots to see and do. 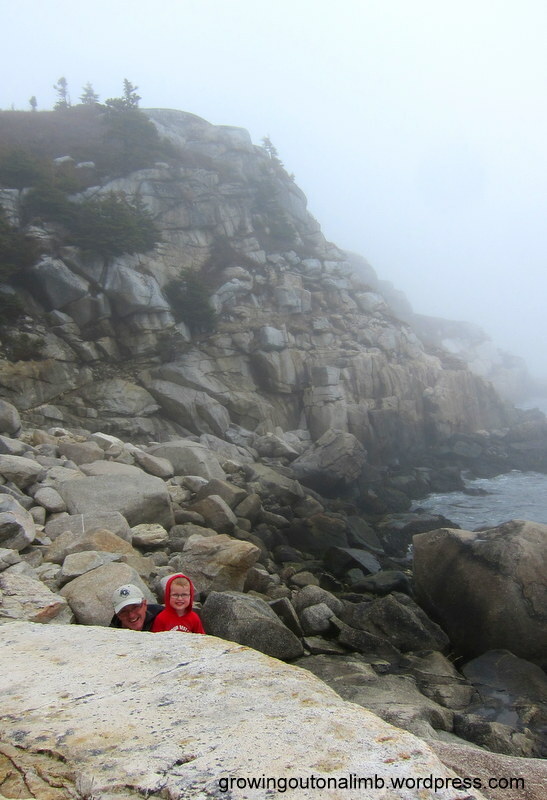 While nana and papa were still here, we took a hike to Polly’s cove. 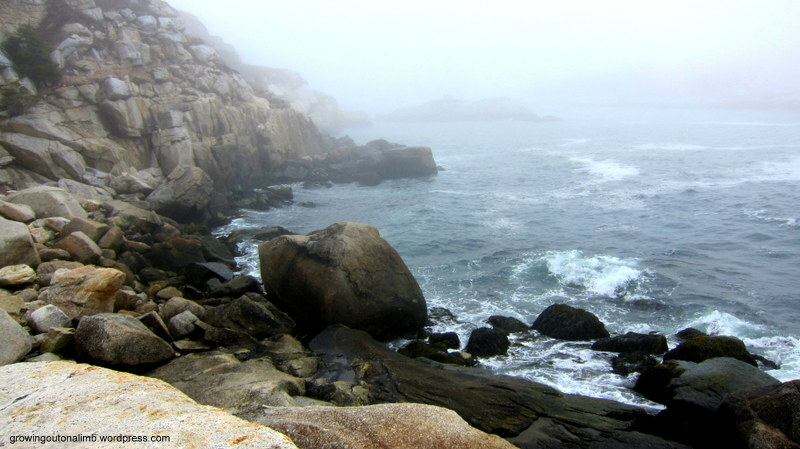 It is near Peggy’s cove but not as touristy … a local secret. Unfortunately the fog was in but what we did see was beautiful. The cliffs are a bit nerve-wracking with the kids running around but we will have to go back and see the view minus the fog. Papa and Emery were being silly for the camera. 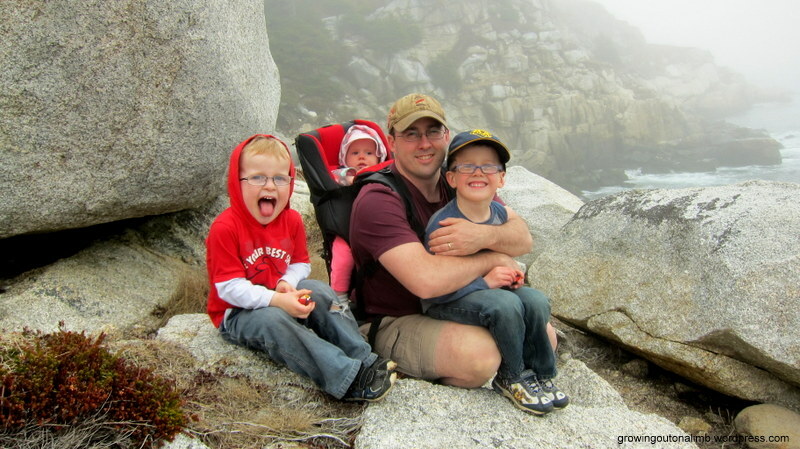 This is definitely the best shot I have yet of daddy and all three kids. 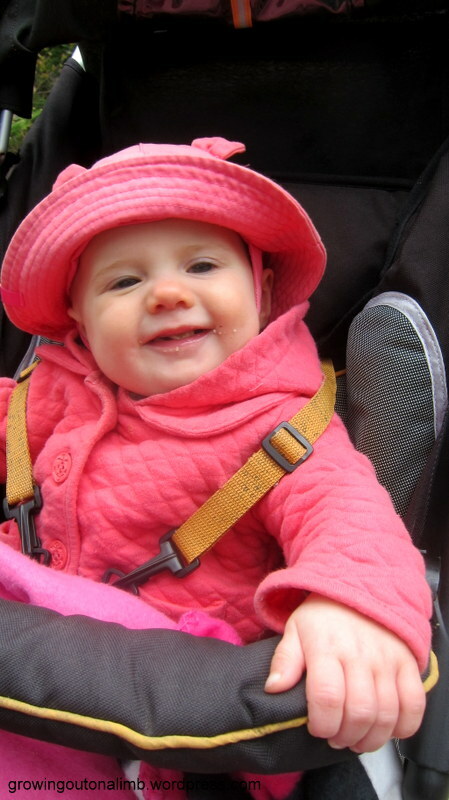 Categories: Eleanor, Emerson, Family Fun, Me and My Daddy, Oliver, Outings, Spring | Permalink. 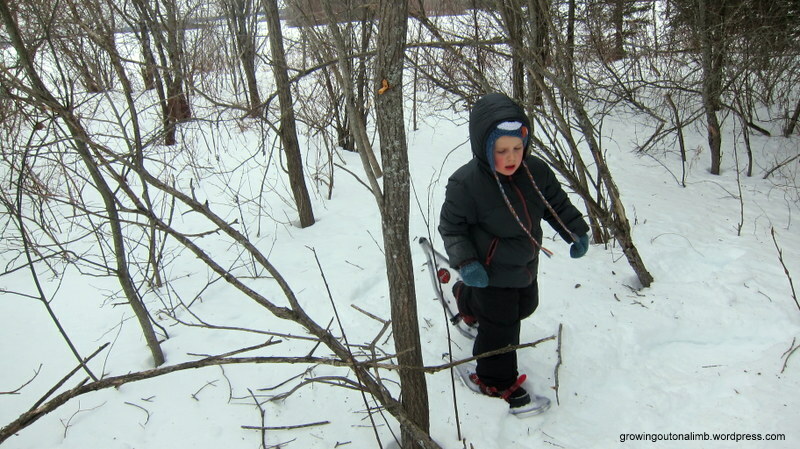 This past weekend Oliver went snowshoeing with hubby. We borrowed a pair of really light-weight and small snowshoes from a friend because we knew anything difficult and clunky would turn him off immediately. He just motors on them! He and daddy just went into the woods behind the house but it was enough for him to get a feel for them. I think we need to get a couple of pairs for next winter! 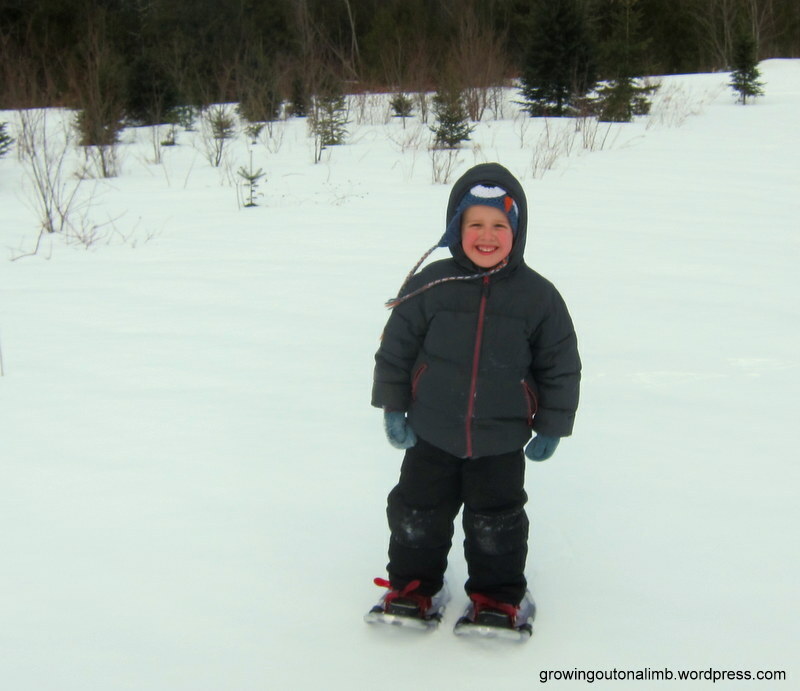 Categories: Firsts, Me and My Daddy, Oliver, Winter fun | Permalink. Recently, Oliver found a youtube video of a boy playing with his angry bird stuffies. 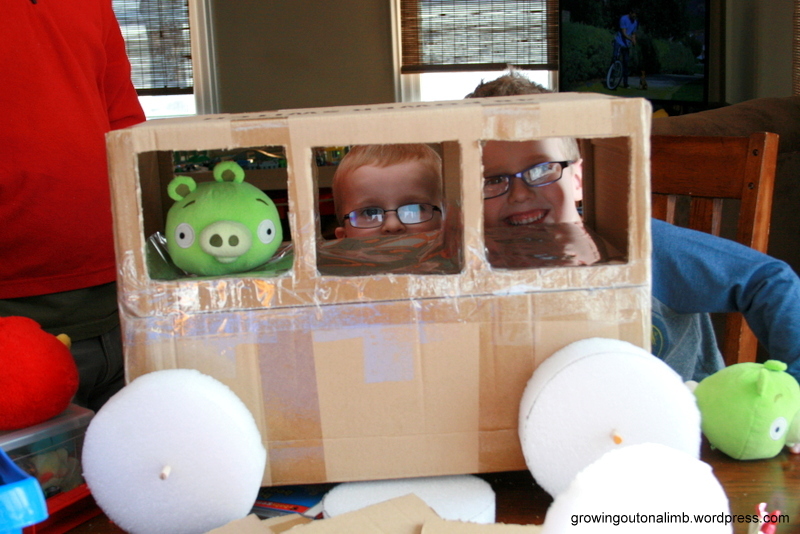 In that video, the boy had a cardboard car that looked like one you would find in the Bad Piggies game. 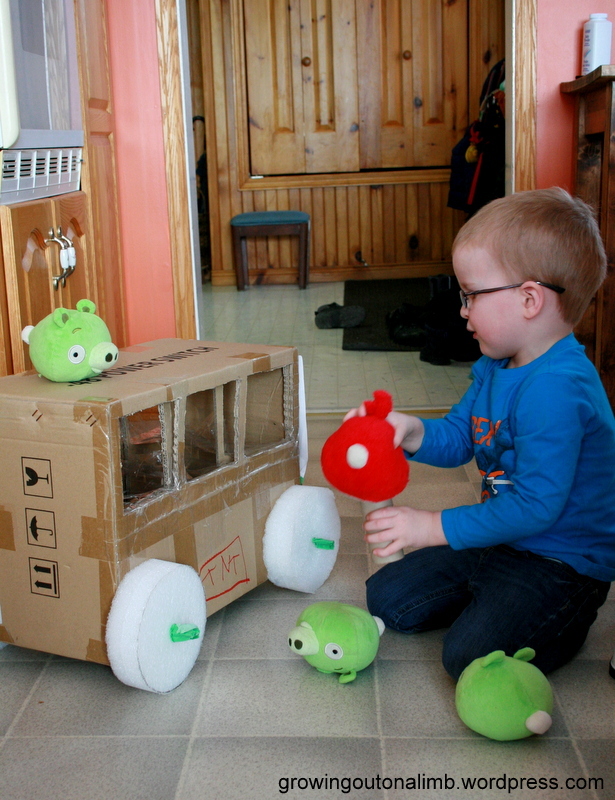 Oliver will often set up angry birds scenes with his stuffies and wooden blocks so he had to have it. He went on about it for days. 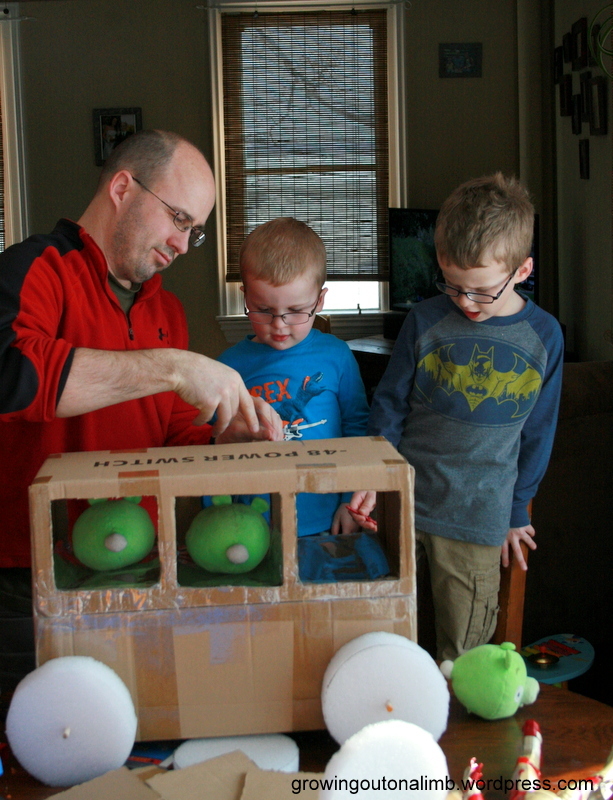 Me, being an endorser of father/son activities (and not knowing how to build the thing), got hubby right on that! The boys thought it was super cool and that daddy was super man for knowing how to build one. I’m not sure if those are bad piggies or angry birds… it depends on the moment around here (although they look pretty happy here!). And of course there had to be two! 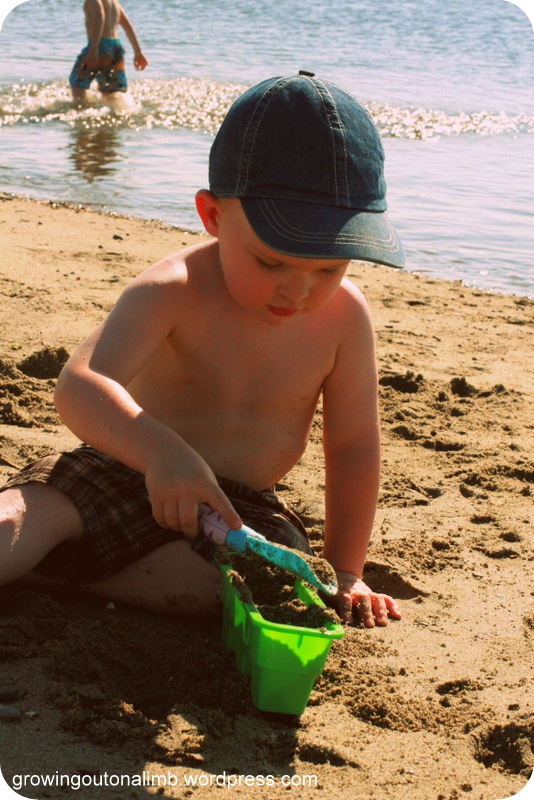 Categories: Emerson, Me and My Daddy, Oliver, Playtime | Permalink. 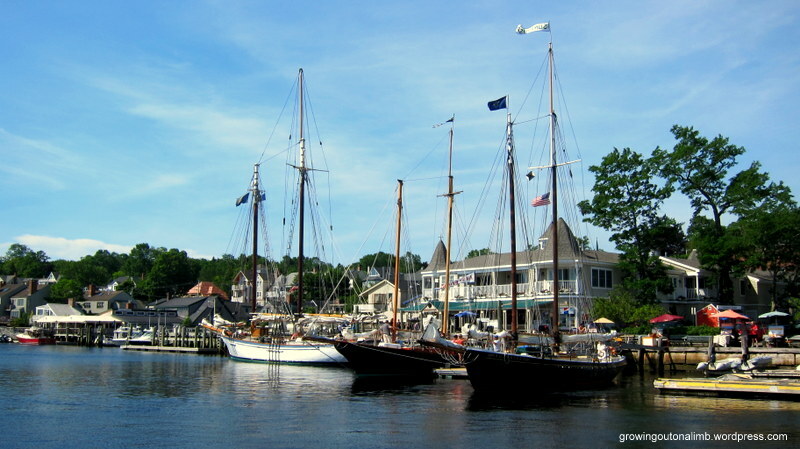 Last weekend we were in Camden, Maine for our summer vacation. 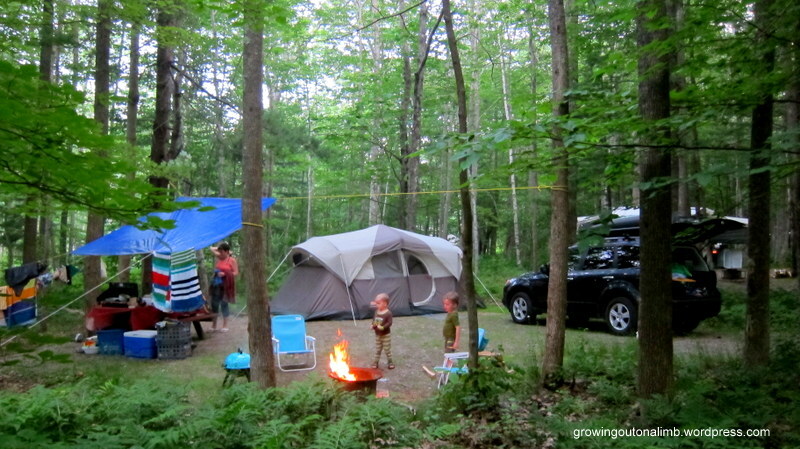 Being rather pregnant, I wasn’t sure we would get one of our more typical camping vacations this summer but we decided to go for it… three nights tenting in Camden’s State Park. Yes, we have a good air mattress. What we didn’t count on was the heat wave. Friday morning it was 31 degrees by 9 am and still 36 degrees at supper time. It made for lots of trips to the water (lake and ocean) and a warm tent at bedtime but being that close to the coast was far better than sitting in front of fans at home. The boys were super excited to go camping. If you ask them what their favorite part was, at least half the time Oliver says “the campfire”. 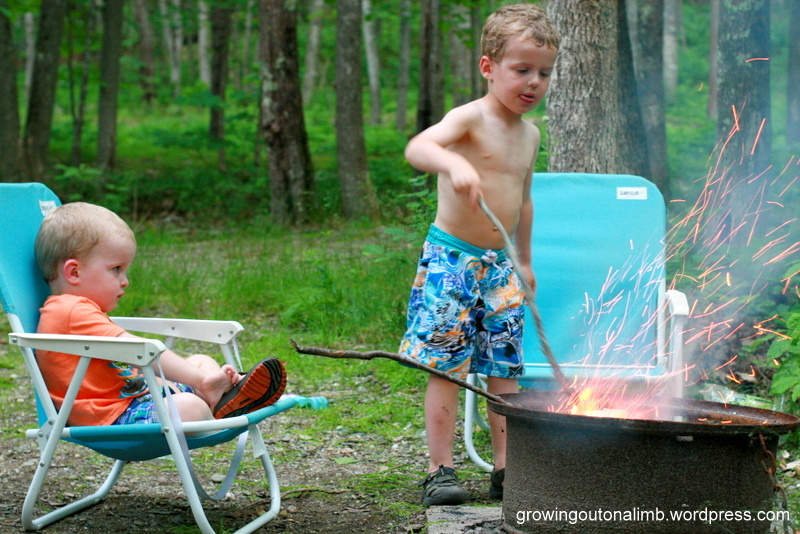 They like sticking their sticks into the fire and seeing the “sparkles” fly up when daddy stokes the fire. 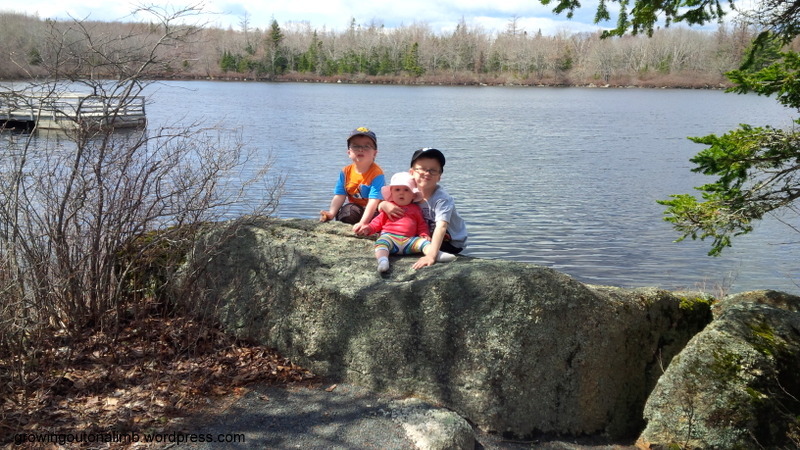 The first morning the boys and I gave daddy some nap time and went to Lincolnville beach, just up the road. The water was make-your-legs-ache cold but boy, it felt good after sitting in the sun for a while. It was also the only beach we found that was actually more sandy than rocky. The boys played quite a bit that morning making sand castles. 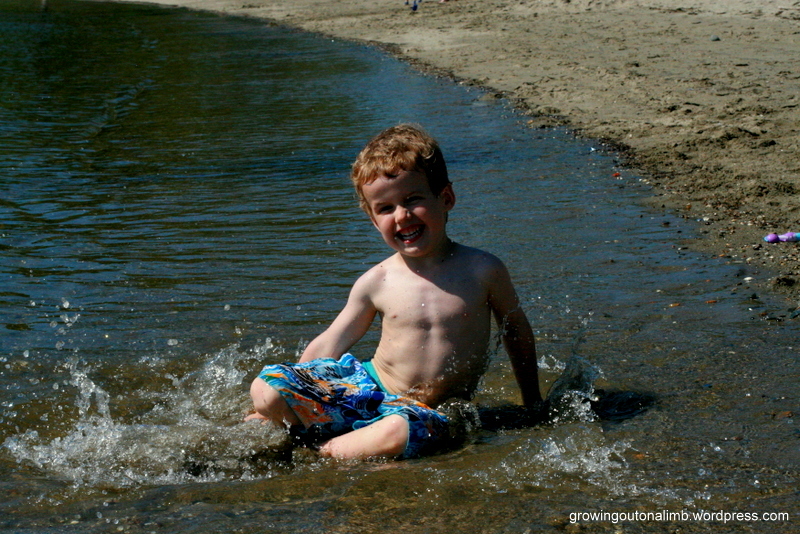 There was a ferry nearby that came about every hour and kicked up waves that Oliver was pretty excited to jump in. 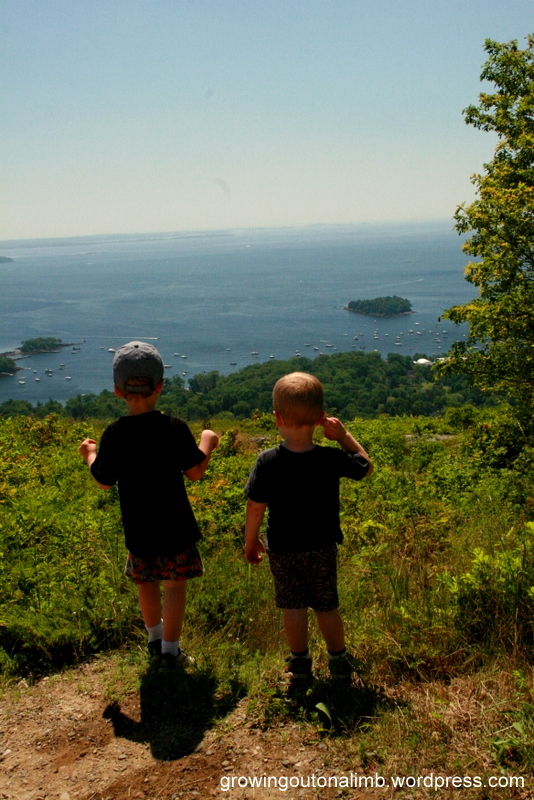 We planned on hiking Mount Battie later that day but it was way too hot. 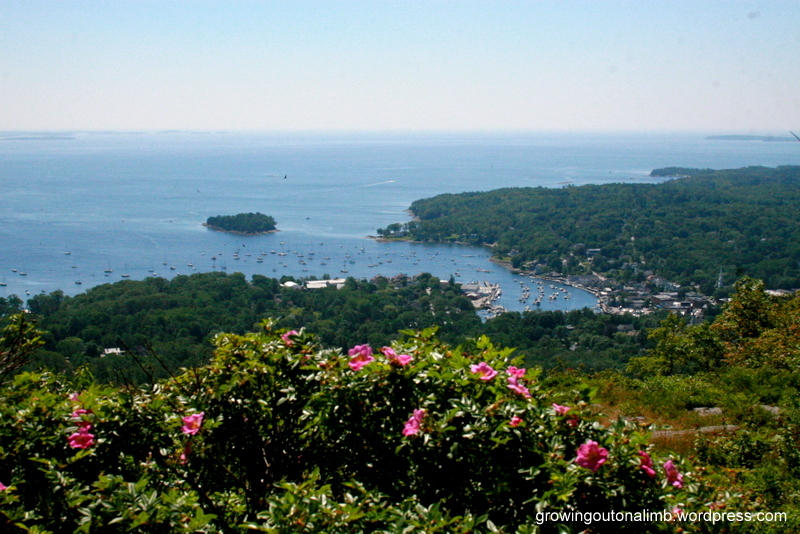 Instead, we drove to the top of Mount Battie and wandered around. It has a really pretty view of Camden’s waterfront. So, why Camden? 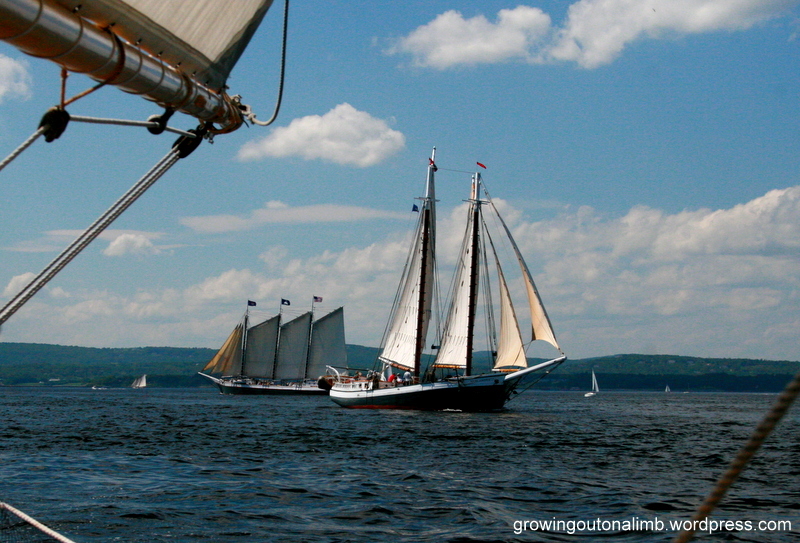 That day, July 5th, was the day of the Great Schooner race… a race from Camden to Rockland between the big windjammers of the area (and there are many!). 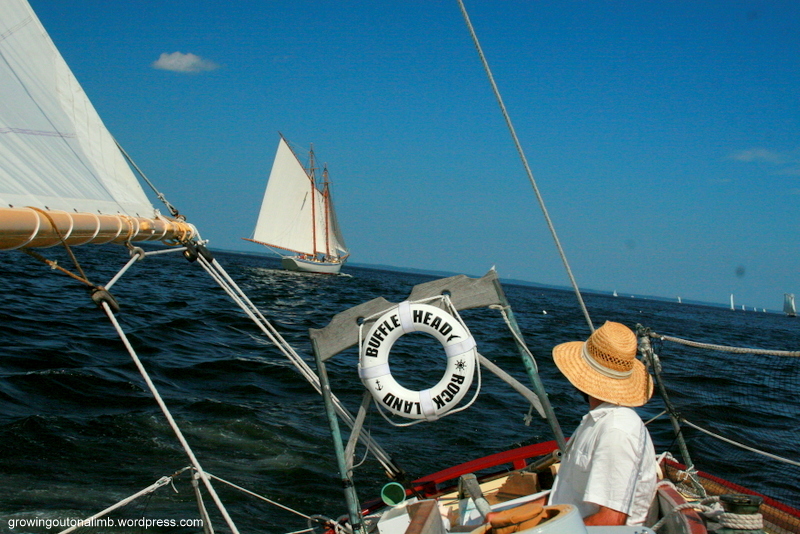 For hubby’s 40th birthday, we chartered a smaller sailboat to be in the Rockland harbor (20 mins south of Camden) for the finish of the race, among the windjammers. Hubby has always had an appreciation for the Bluenose and its history so this seemed like a really cool gift for a milestone birthday. It was the Bufflehead and a really neat experience! Captain Dan was so welcoming and down to earth and knows a lot about the big windjammers… you can easily tell he genuinely loves doing what he does. He even let off a little (but loud) cannon when we got near a couple of his buddies’ ships. We will recommend him to anyone looking for a similar experience! 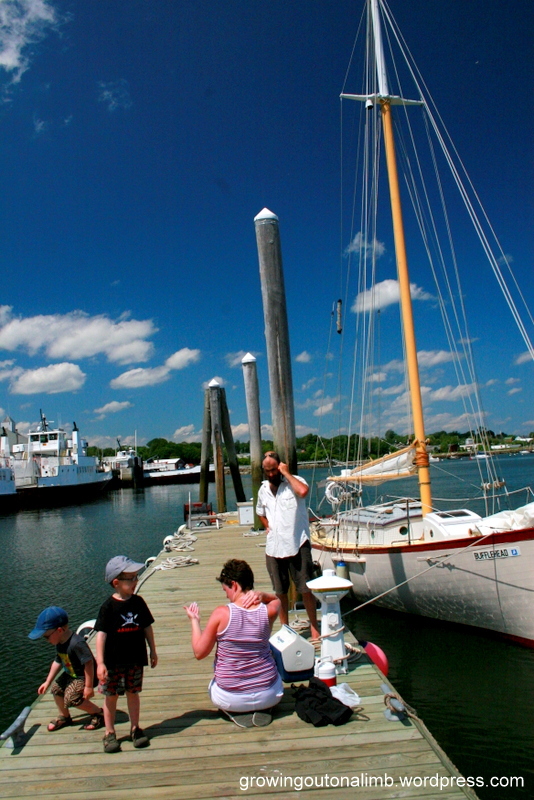 Here’s the bufflehead and us getting ready to board. 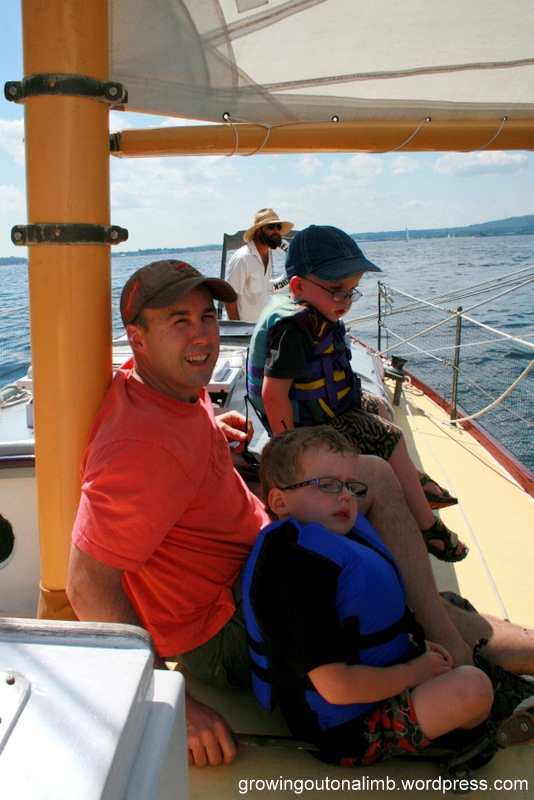 The boys were really good on the boat… kind of quiet, just taking it all in, but they seemed to enjoy it overall. 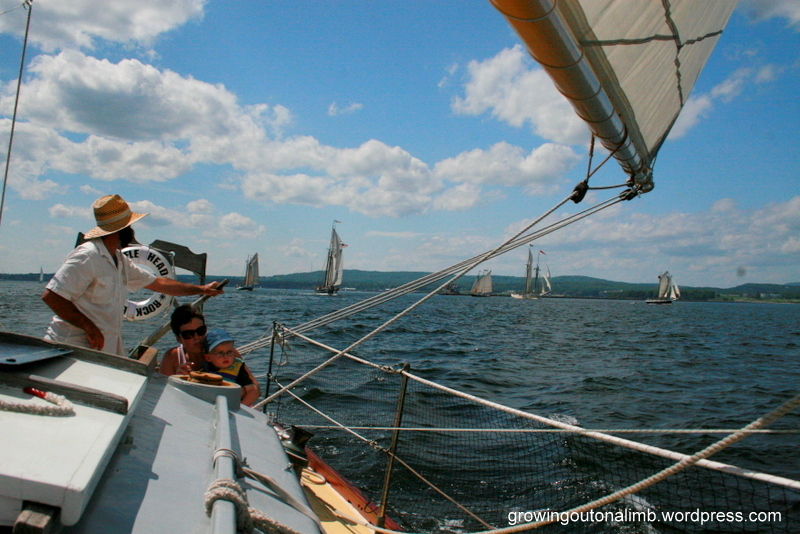 You can really get a sense of all the big windjammers in the water with us. I think hubby enjoyed his birthday gift! I wish I could remember all of the stories Dan told us about the big windjammers. They were really pretty to look at and all different from each other so interesting to hear about. 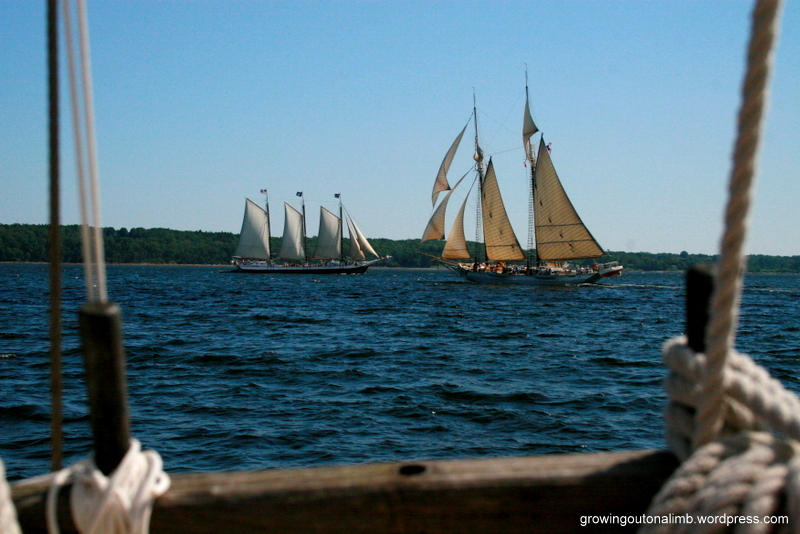 The one on the right with the three front sails and topsails was my favorite. Emery stuck with me for most of the trip. He even nodded off at one point. It was a pretty comfy spot for both of us, I’ll admit. I kept thinking what a neat experience that was for the boys. And what a nice spot to be on such a hot day! This one kind of shows the tilt the boat got when the sails were full (and I say “kind of” because it got quite a bit tippier than that!). I admit I looked back at Captain Dan a couple of times to make sure I shouldn’t be worried. 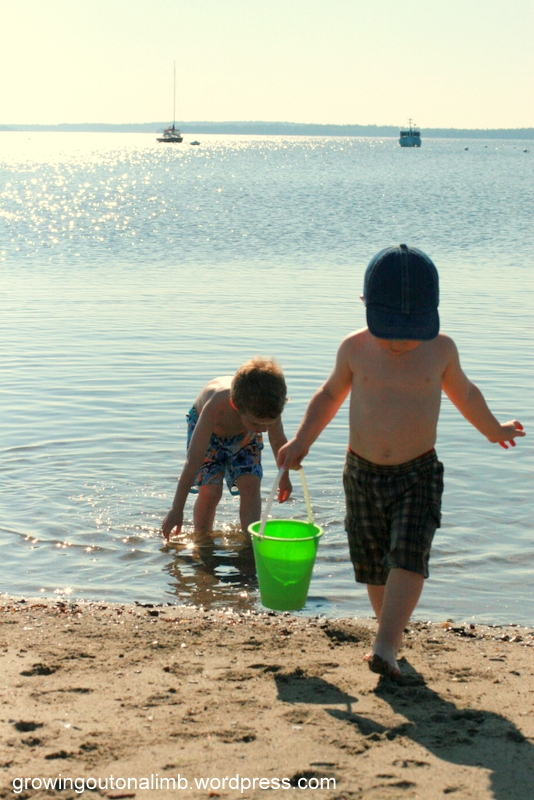 We spent more time at Lincolnville beach Saturday morning, only daddy came with us this time. There isn’t a lot of kid-oriented stuff in that area but we don’t feel our kids need amusement parks and water slides at this age anyway. They were perfectly happy at this beach on Friday morning so we went back the next day and they had a ball splashing in the waves again! 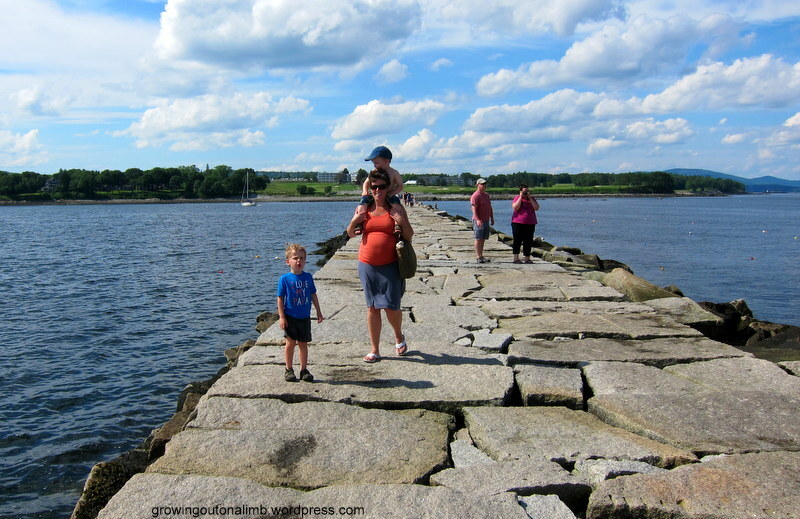 That afternoon we decided to walk the breakwater in Rockland. It is 7/8 mile and leads to a big lighthouse. The walk was tricky because the big stones were all pieced together like a mosaic, so we ended up carrying Emery most of the way. 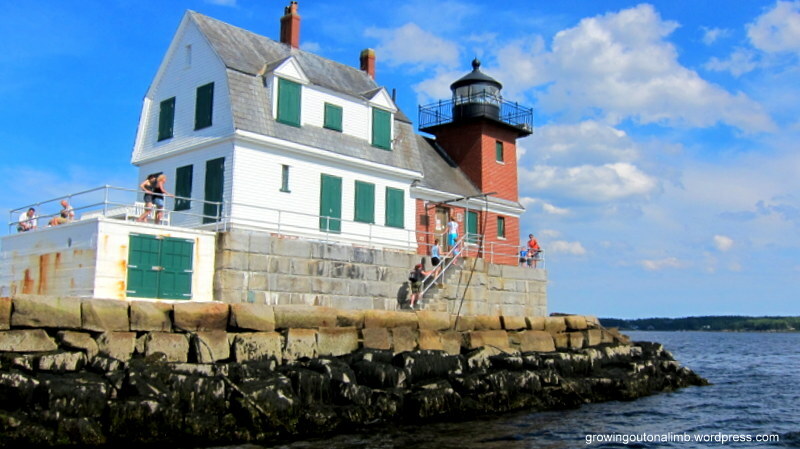 Here we are at the lighthouse (see us at the end?). After that walk we were SO hot, we went back to the lake we had gone to the previous two nights… Barrett’s cove in Camden State Park. I guess we’re creatures of habit but again, the boys had such fun, why not go back? 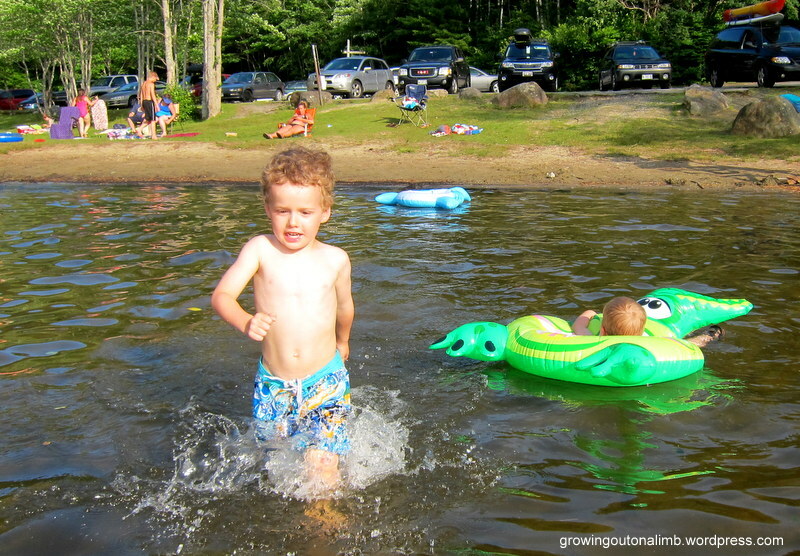 And the lake was perfect… warm and shallow enough for quite a while so the kids could play freely. See the floaty? Best $5 I’ve ever spent. Oliver has been really resistant to try any sort of floating device up to this summer but he absolutely loved floating around in these things! He’ll be swimming in no time. 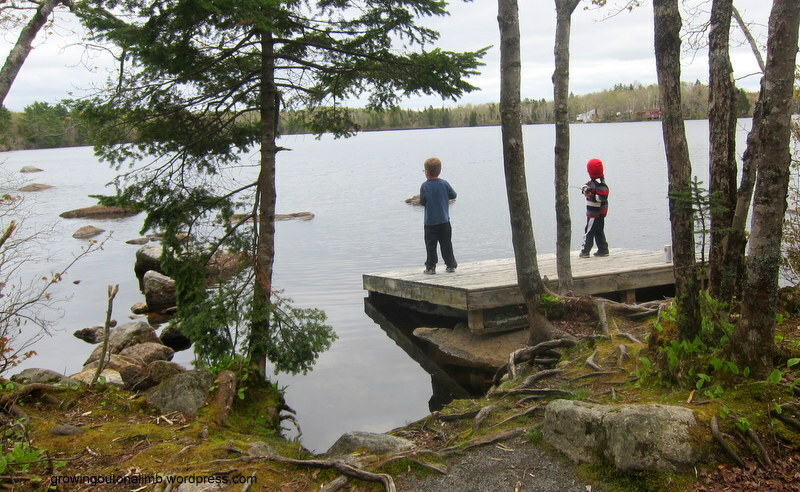 This lake was also so shallow that both boys could walk themselves along the bottom with their hands really easily. At one point during our second night, Oliver was doing just that and suddenly proclaimed to no one in particular, “This is great! This is soooo great!”. Home sweet home. 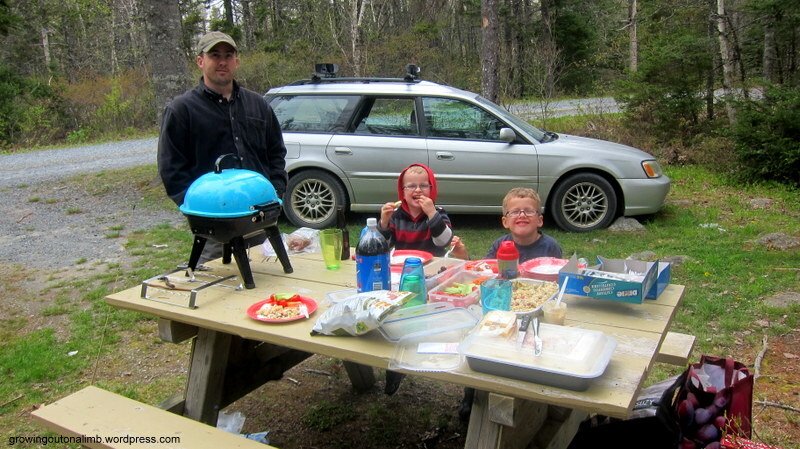 Camden State Park is like most state parks… no frills. We realized on this trip that the stay would have been a bit easier at a campground that was geared a bit more toward kids (playground, pool, etc) but it was a really nice campground … clean, wooded sites, free (and good) showers, and surprisingly quiet for a July 4th weekend. 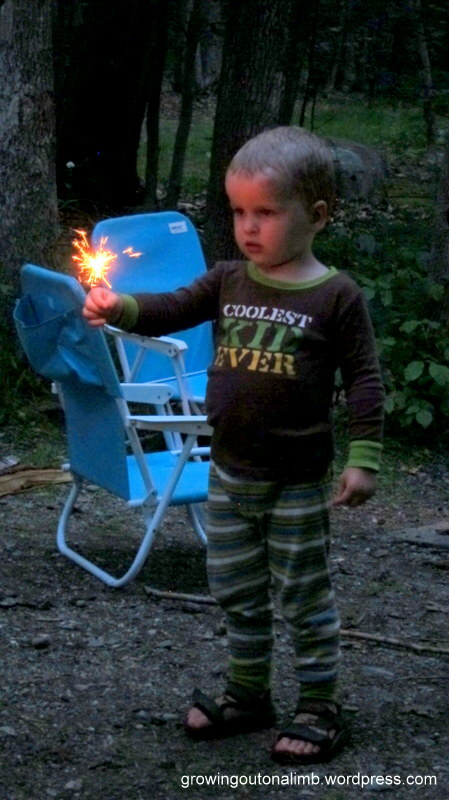 Emery was kind of mesmerized by the sparklers. 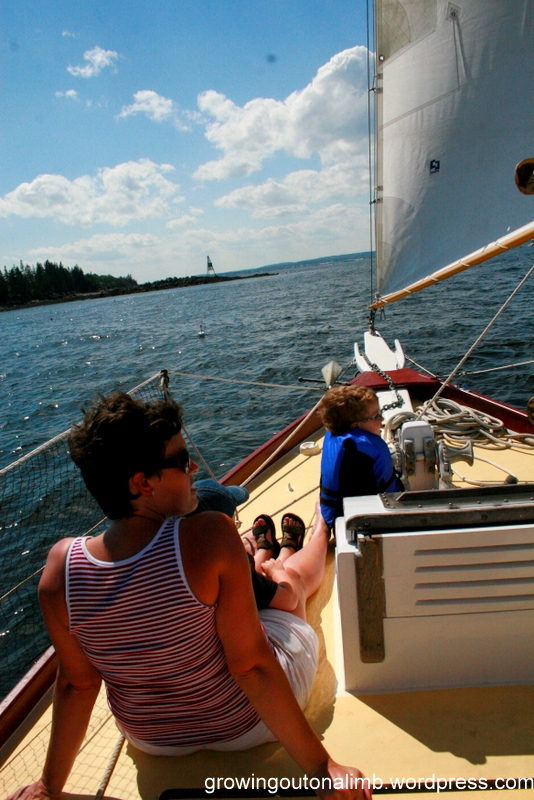 Campfires, tenting, oceans, lakes, sailing, and let’s not forget seat dancing on the way home… it was a nice trip. There were definitely some really trying moments for mommy and daddy (a couple of which made us consider coming home a night early) but overall we had fun and I’m really glad we explored this part of Maine. And yes, at seven and a half months pregnant, I am even glad we braved the camping. I’m not sure how much of these trips the kids will remember but I can’t help thinking that the experiences and time spent together as a family are shaping them in a positive way just the same. 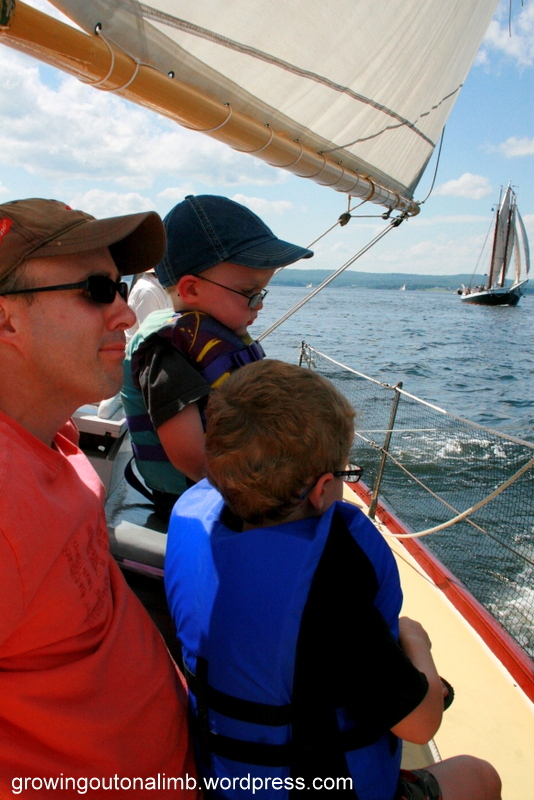 Categories: Emerson, Family Fun, Firsts, Me and My Daddy, Oliver, Summer!, Vacation | Tags: camping, maine, sailing, swimming, vacation | Permalink. This is a craft we did earlier in April in the hopes to persuade Mother Nature to quit with the snow and bring on the spring showers already! I found this idea in Oliver’s Highlights magazine. 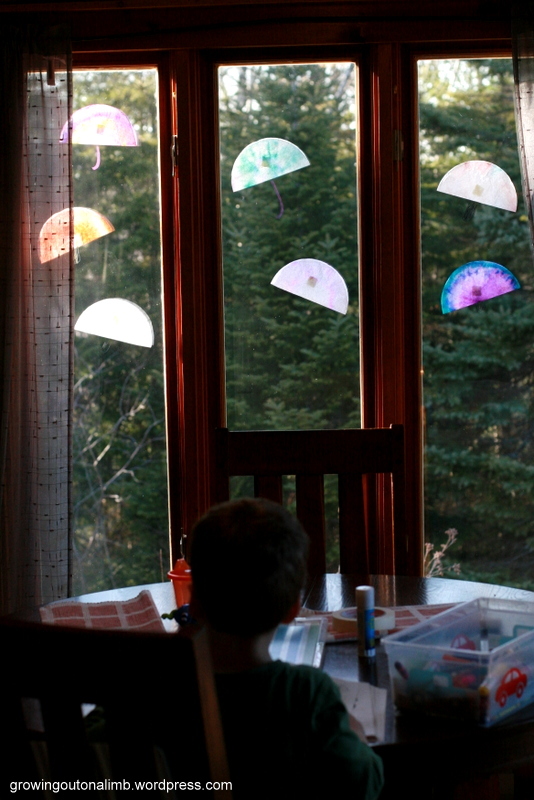 They are coffee filters colored with markers – that was the most fun part because Oliver and I liked being creative with our designs. Then he sprayed them with water to make the colors bleed. 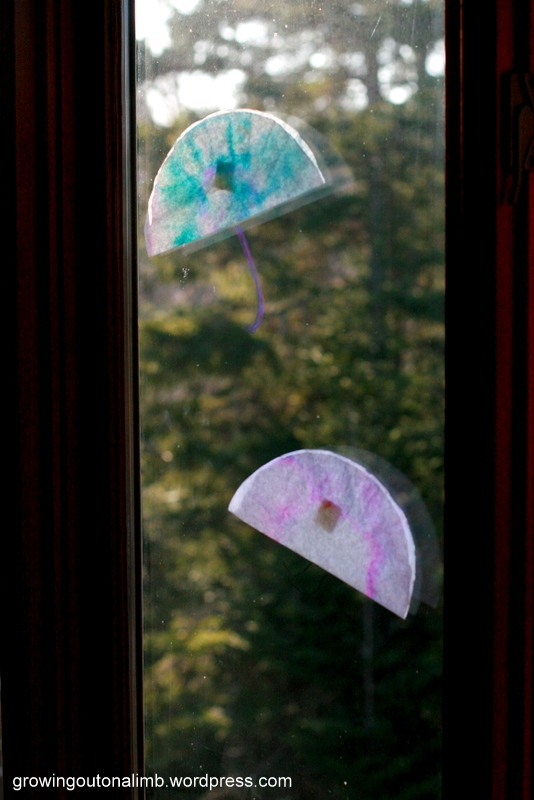 They were folded in half, taped to the window, and then Oliver drew the umbrella handle onto the window with a dry erase marker. It was fun but I’d change a couple of things the next time: first, washable markers bleed too much so our designs were lost; second, the handles get kind of lost in the trees outside our window so I think I’d go with pipe cleaners next time. It’s always fun to spend one on one quiet time with Oliver though. And they are a cheery pop of color for spring! This craft is an oldie but a goodie. The best part? I had nothing to do with it. 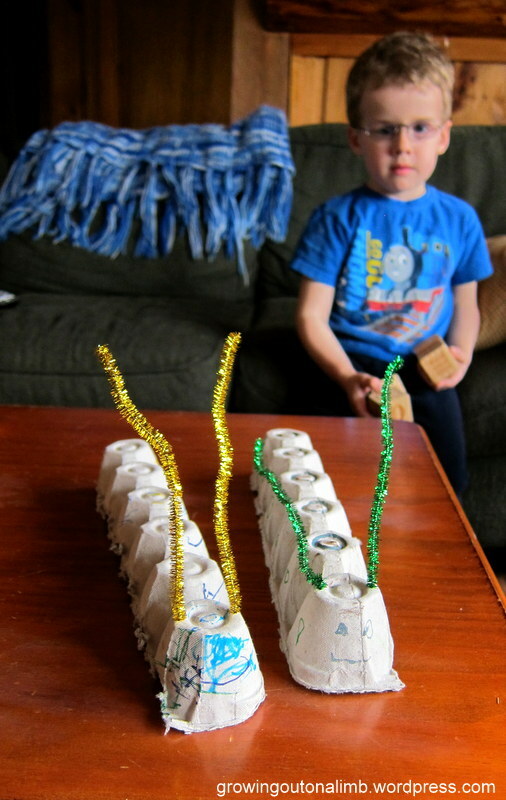 I got up from a nap and Brian and the boys had made these caterpillars from an old egg carton. I love them!! Categories: Craftiness, Emerson, Family Fun, Me and My Daddy, Oliver, Playtime, Spring | Permalink.